Many years of collecting and now the business and building have sold. It's the end of an era for Mr. & Mrs. Turk. They have moved and left behind many more beloved belongings. A partial liquidation was done 5+ yrs ago, now more has been gone through and added for this final liquidation. Furniture from different eras, unique, elegant, mid century and some just plain fun. 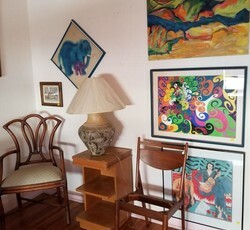 Art, old toys, collectibles, decor, rugs and an amazing marano glass collection. Desks, sofas, tables, carts, chairs, benches, dressers, iron and a grand piano. Books, books, books! Amazing collection! Please bring help for loading your purchases. We can help some but are limited in helping. Thank you for understanding. It's an opportunity for a great last treasure hunt from this amazing family.